Top-left shows sign of fold, otherwise in a very good condition. 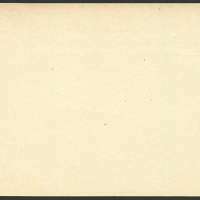 A piece of postal stationery is a stationery item, such as a stamped envelope, letter sheet, postal card, lettercard, aerogram orwrapper, with an imprinted stamp or inscription indicating that a specific rate of postage or related service has been prepaid. It doesnot, however, include any postcard without a pre-printed stamp. Postal cards are postal stationery and have a printed or embossed indicium and are sold by governmental postal authorities. Some of the forms taken by postal cards include the regular single card, the attached message-reply cards, airmail postal cards, and official postal cards used for official government business with a "penalty for private use". 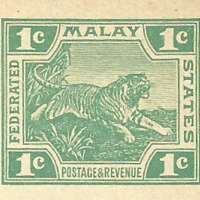 The Federated Malay States (FMS) was a federation of four protected states in the Malay Peninsula - Selangor, Perak, Negeri Sembilan and Pahang - established by the British government in 1895, which lasted until 1946, when they, together with the Straits Settlements and the Unfederated Malay States, formed the Malayan Union. 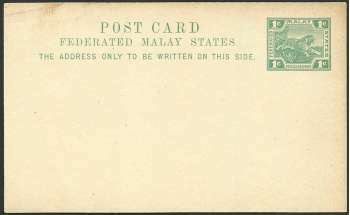 Two years later, the Union became theFederation of Malaya and finally Malaysia in 1963 with the inclusion of Sabah (then North Borneo), Sarawak and Singapore. The United Kingdom was responsible for foreign affairs and defence of the federation, whilst the states continued to be responsible for their domestic policies. Even so, the British Resident General would give advice on domestic issues, and the states were bound by treaty to follow that advice. The federation had Kuala Lumpur, which was then part of Selangor, as its capital. The first FMS Resident General was Sir Frank Swettenham.